A pro-North Korean newspaper in Japan predicted Wednesday that the "new history" of relations between the North and the United States will move steadily forward in the new year, even though there could be ups and downs during the process. 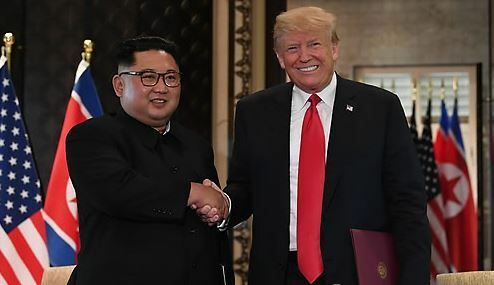 "The new history that started in 2018 will ceaselessly continue despite ups and downs," the Choson Sinbo said in an article, referring to "important changes" that North Korean leader Kim Jong-un predicted for the world in his summit with US President Donald Trump in a June summit. Its relatively rosy prediction for next year appears to reflect Pyongyang's willingness to continue talks on its promised complete denuclearization despite a prolonged stalemate in negotiations with the US. The North wants sanctions relief as a quid pro quo for what it claims to be substantive denuclearization steps since the June summit, while the US demands more tangible measures before making major concessions. The paper also emphasized leader Kim has played a leading role in setting in motion changes on the Korean Peninsula throughout this year, backing up its prediction that things will not move backward next year. Citing the North's suspension of nuclear and missile tests, and dismantling of a nuclear test site, it also claimed that those steps are intended actively to pave the way for a "new relationship" between North Korea and the US. Last week, the Choson Sinbo said that there will be "no reversal of the new historic flow that started from Panmunjom" at which the leaders of the Koreas agreed to improve cross-border relations and work toward the complete denuclearization of the Korean Peninsula.